This iteration of Wilderness Chef is an homage and thanks to a good friend, Jason. He is, unwittingly, one of the people who made me change how I thought about backpacking meals – we took many trips together, and Jason being the amateur chef he was, would always bring some little extra thing that felt like a luxury. A couple weeks ago I had the opportunity to go do an overnight in the Rockies west of Denver, CO, and coincidentally I had just stumbled across an old note from a trip my wife and I took with Jason and his wife, MANY years ago, where he made back country Thai food. This is my take on those old memories, Rocky Mountain Thai! I didn’t do a dedicated video on this one, but if you’d like to see it, it’s embedded in my Lost Creek Wilderness video, starting at about 27:30. This is an easy refreshing soup, not overwhelming in flavor, but slightly tangy and exotic. 1) Cut peppers into slivers, julienne style. (Note, if you don’t plan to cook this for a couple days, leave the pepper whole and cut it in camp – it will keep better). 2) Chop lemongrass into 1/4″ segments. 3) Combine all veggies, spices and bouillon in a ziplock bag. Bring 2 cups of water to a boil. Add contents of bag, reduce to a simmer, and let cook about 10 minutes to dissolve bouillon and mix flavors. The spice of the chicken and marinade is countered by the sweetness of the coconut. Very filling and satisfying. On the coconut milk – I have found Goya and other brands of powdered coconut milk, typically with the Central American foods as opposed to Asian. On this particular trip I found a small box (a 6-oz. box like a small school lunch pack) of liquid coconut cream and that worked very well also. 1) Chop basil, and pack in ziplock bag with ginger and curry paste. 2) Mix marinade ingredients in a small spill-proof container. 1) While setting up, pour the marinade mixture into pack of chicken and let set aside to marinate. 2) Boil 1 cup water. Add rice, remove from heat and cover. 3) In a separate pot, heat chicken and marinade until chicken is heated through with a bit of char. 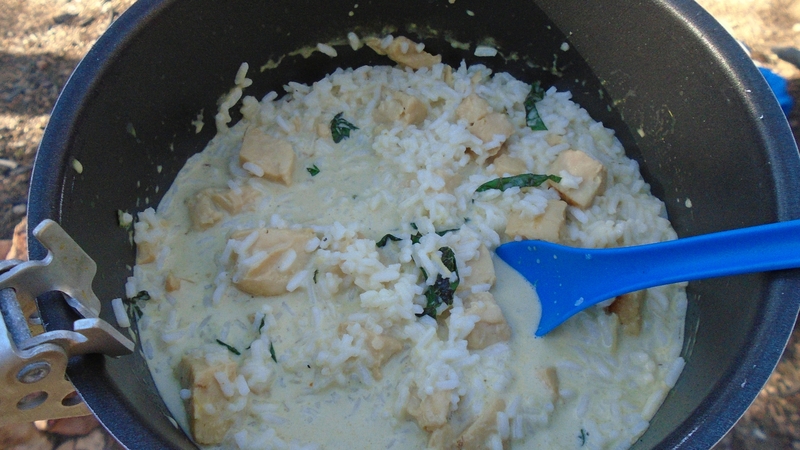 4) Add basil and curry mixture, and coconut milk (or powder plus water). Mix and heat through.